Found 8657 Keyboard Ipad Products. SPECIFICATION: *Operation scope: *Modulation method: GFSK *Operating current: *Working voltage: 3.0v *Working temperature: -10 ℃ ~ 55 ℃ *Key strength: 60±10g *Standby current: *Sleep current: *Key life: about 3 million strokes *Battery: AAA * 2 HOW TO USE: 1. Put in 2 X AAA battery cell 2. Slide the power switch off-on 3. Press the keys Fn+C to enter the connection mode 4. Turn on the Bluetooth on your device Settings, search devices, find the Bluetooth Keyboard signal and connect 5. If the connection is successful the indicator will stop flashing NOTE： When the keyboard is not operated for 10 minutes, it will automatically enter the sleep mode. When the keyboard is used again, press any key and wait for 2-3 seconds. The keyboard will automatically connect to the device (requiring device support). OMOTON: We are passionate about excellence, so for every OMOTON purchasing, you can expect to get qualified products with really good price and amazing after service! For this keyboard, it is sold exclusively by OMOTON. And OMOTON Mall provide you friendly customer service and worry-free 1-year warranty. 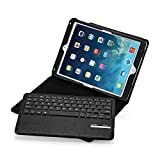 Specifications: Bluetooth Edition: Bluetooth 3.0 Dimensions: 285 x 120 x 6 mm / 11.2 x 4.7 x 0.2 inch Buttons: 78 keys (including 13 iPad Hot keys) Weight: 282g / 9.95 oz Operating Range: Up to 10 meters / 33 feet The keyboard is made of superior plastic instead of aluminum. 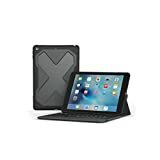 Support Devices Including: Apple New iPad 9.7 Inch 2017, Apple iPad Pro 12.9" / 10.5" / 9.7", iPad Air 2/Air, iPad mini 4/ 3/ 2/ 1, iPad 2, iPad 3, iPad 4, iPhone 7/ 7Plus, iPhone 6S/ 6S Plus/ 5S/4S etc. 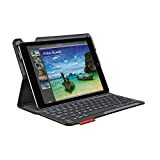 Samsung Galaxy Tabs, Galaxy Notes, etc ( Hot Keys may NOT work properly ) Bluetooth-enabled PCs or Laptops with Windows XP / Vista / 7 / 8, Not Compatible with Windows 10. Smartphones or tablets (not including Dell tablets) with Android 3.0 and above Please Note: The keyboard will automatically go into power savings mode after 10 minutes of inactivity. Press any key and wait 2-3 seconds to wake the keyboard. P.S.1: There is no Escape key for Macbook. 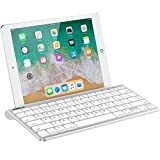 P.S.2: This keyboard may not compatible well with the Windows 10, Mac mini, Macbook Pro, iMac or Moto RAZR P.S.3: This keyboard may not compatible well with Android 4.4.2 devices. 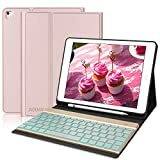 To continue using the keyboard, please lower your Android system to a version below 4.4.2.
iPad Keyboard Case for iPad 2018 (6th Gen, 9.7) ipad 6th generation cases with Keyboard iPad 2017, iPad Pro 9.7, iPad Air 1, iPad Air 2 keyboard case with 360 Degree Rotatable, Wireless Bluetooth Keyboard for Ipad cases 9.7 inch, Apple Tablet Slim Cover, Smart Auto Sleep-Wake Ipad cases Features: * Leather iPad keyboard case 6th generation with magnetic closure, support adjust the tilt angle * The ipad case with keyboard supports all the function keys iPad version, Bluetooth: 3.0 * Our ipad cases can protect the iPad from bumps and scratches accidental hard, dust * Detachable Bluetooth keyboard for ipad with frosted magnetic hybrid case * Elegant Folio has support display and high quality Bluetooth keyboard for iPad Pro * Aluminum wireless ipad pro keyboard support bluetooth & PU magnetic hybrid leather cover with 360 degrees full protection of ABS material * Supported operating systems: ios4.3.5 (iPhone, iPad), Android system, Windows (XP) or a newer version * Charging time: 2 hour, working time: 3 weeks Uninterrupted working time: 40hour, USB charging cable included * Rechargeable via USB(cable supplied) Compatible Device: * iPad Pro 9.7- model: A1673, A1674, A1675 * iPad Air 1 - model: A1474, A1475, A1476 * iPad Air 2 - model: A1566, A1567 * New iPad 9.7"(2017) - model: A1822, A1823 * New iPad 2018(6th Gen) - model: A1893, A1954 Package Included: * 1 x iPad Keyboard Case Cover * 1 x Wireless Bluetooth Keyboard * 1 x Micro USB Charing Cable * 1 x User Manual Friendly Reminder Please refer to the USER MANUAL for more details. If you have any questions or needs, please contact us at any time." 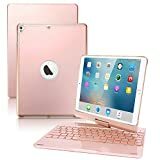 MODEL: This keyboard case is fit for iPad 9.7 2018/2017,iPad Air 1, iPad Air 2, iPad Pro 9.7. iPad Air1 (A1474/A1475/A1476) iPad Air 2 (A1566/A1567) iPad 9.7 Inch 2017 5th Gen (A1822/A1823) iPad 9.7 Inch 2018 6th Gen (A1893/A1954) iPad Pro 9.7 (A1675/A1674/A1673) DESCRIPTION: Detachable set of keyboard. multifunctional protective sleeve and keyboard are independent. Comfortable. 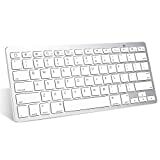 high quality and natural ABS keys provide a quick response and silent typing experience. Magnetic attraction design. The bottom of the keyboard is designed with magnetic attraction, which has strong fixation and is not easy to fall off. Triple-fold design makes your iPad, one second turned into a laptop. 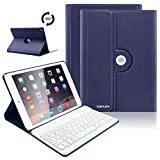 Easily set up iPad. turn on the keyboard and pair automatically. It can also be used with other Bluetooth devices. How to connect the Bluetooth? 1.Turn on the open button at the bottom right. Press the connect button on the keyboard.then the blue light can be flash. 2. Open your Tablet, select Settings--> Bluetooth,open your Bluetooth signal, keep the Bluetooth showing on search state. 3.Then your Tablet will search for all nearby Bluetooth-compatible devices. 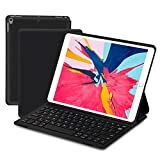 In the list of available devices, select the one that says"Bluetooth Keyboard 3.0" and a pass-code will appear on your Tablet screen. Then enter the pass-code and press the "Enter" Key. Product specification: Bluetooth 3.0 Interface Standard Texture of material: PU leather case ,ABS keyboard Charging time: within 5 hours Standby time:100 days operating distance: 10 meters PACKAGE INCLUDED: 1*UP leather keyboard case 1*ABS Chiclet keyboard 1x User Manual 1x Micro USB charging cable Satisfaction Guaranteed: JADEMALL offers a 1-YEAR hassle-free warranty.